whereas Chalcedon (the one we are divided on) was the most universal, in terms of representation, number of bishops, etc.. I don't know about that. Chalcedon was not ratified by any Bishop from the Patriarchate of Alexandria of that time. Pope DIoscorus' successor Pope St. Proterius approved it. And thus according to the custom of Egypt, as the Egyptian bishops pointed out, so did the Holy Synod of All Egypt. It may have had many Bishops, but I don't know that it's true that it had the broadest representation and acceptance. 450+, with bishops from the West, and all over the East, even from the Arabs and Ethiopia. You know that the OO's consider St. Timothy Aelurus to be the true successor to St. Dioscoros. Of course it's perfectly fine for you to uphold what your Church teaches on the matter, but I would hate to think you were inviting a polemical discussion about Chalcedon. That being said, I would like to proactively warn you, Deusveritasest, and anyone else who may be thinking of polemics to take it to the private forum. I'd like to keep this on topic. If you read the original post, it asks whether unity will happen in the lifetime of a 17 year old, and whether the OO's venerate icons. It is also permissible to address Rakovsky's question at the top of this page ("Is miaphysitism a mandatory belief in the OO church?") since that was what brought this thread up again. I'd like to have this thread narrowly address these issues and not go off on tangents about what happened at Chalcedon, etc. I agree, especially with the part I highlighted. To say that every aspect of an ecumenical council is incapable of making a mistake is in a sense a "docetic ecclesiology". The Church, like Christ, is a divine-human organism. She is in communion with Christ in his Holy Spirit, yet at the same time, she is led by human men who are capable of error. It seems as if many EOs (not that I'm picking fights) forget this. Is this the root of the difference? 1.A. Apparently, the Eastern Orthodox Church believes Christ has two natures, and that the two natures remain two natures even after they are united in the person of Christ. 1.B. The Eastern Orthodox Church also either allows or accepts Miaphysitism, which says he has one nature after the union of the two natures. 2.A. I read in George Florovsky's "The Reaction in Jerusalem" that the OO leader Dioscorus defended himself at Chalcedon by saying that Dioscorus' "Robber Council" of Ephesus “Flavian was rightly condemned because he stillmaintained two natures after the union. I can prove from Athanasius,Gregory, and Cyril that after the union we ought rather to speak only of oneincarnate nature of the Logos." 2.B. The Oriental Orthodox Church adheres to Miaphysitism, which says he has one nature after the union of the two natures. Does the Oriental Orthodox Church allow for the idea that Christ still has two natures after they are united in Christ's person? Coffee mixed with honey has both coffee and honey. Perhaps you can call it "Honey Coffee". It is both sweet and energizing. Perhaps you can call it "sweetly energizing". In other words, the EOs say it's "Coffee" and "Honey" and it's "Honey Coffee", and Dioscorus (and thus the OOs) respond by saying: "No, you cannot say it is still Coffee and Honey after they are united in the same glass!" I think you are presenting the EO view after Constantinople II, not that which was presented at Chalcedon. I don't think that your view is that of Chalcedon on its own, but of Chalcedon as modified by Constantinople II. If you mean do OO believe that the humanity remains humanity after the incarnation then absolutely yes. This has always been the case. The humanity and divinity of the Word retain their integrity but are not divided or counted separately. The mixture of two material substances is not a good analogy for the incarnation. The one which the Fathers more often use is that of fire and iron. I am not sure that a more detailed discussion of Chalcedon is permitted in this forum? Salpy? Amen. Even the Indian theologians use this same analogy to explain theosis by proxy. The Divine Nature is inaccessible to our mortality, as Its Self-Existing, whereas we depend upon It for our existence. The Indians, like the Cyrillian fathers, use the analogy of the ignited iron to explain how, while the Divine is beyond the physicality of our own material substance, we can be directly affected by the Divine and experience It just as the material Iron is heated by the Flame, which is itself immaterial. The Heat is not necessarily a substance of its own which unites through subsistence with the Iron, rather the atoms of the Iron are excited by the force of the Heat, and the Iron ignites. The Heat remains unaffected (in this model, we know in science that heat is a force which dissipates over time, whereas the Divine is unchangeable) by its contact with the Iron, only the Iron is changed to become like the Heat, that is to say, hot. But the Iron will not or ever can it remain hot by itself, it must be in contact with the heat source, with the Flame, to share its principles of heat. We are not changed into Divine when we experience God, but we are deified in the same sense that the iron is heated without itself necessarily becoming the Flame. Well, if it were only as simplistic as your concise synopsis explains, unfortunately there are more complex, sociopolitical, theological, historical, and linguistic factors which muddy up such clear thinking between the jurisdictions. I would say that it is incorrect however to say that the EO "either allows or accepts Miaphysitism" because if such were the case, then anathemas aside we would be in reunion. Oriental Miaphysitism in theological practice seems to be different than EO interpretations, especially in the context of post-Palamas EO theology, and these are where misunderstandings continue between us regarding our mutual differences. Further, we only speak of "two" conceptually, not in practice. We in OO think of Christ as existing in One (mia) Nature, One (mia) Person, having One (mia) Will and Operation. We only think about His humanity to try to understand some of the human things He performs as the Son of Man, and yet we fully adhere to the Union, which abolishes "two" and exists as "one" which has been the crux of the debate for all these centuries. but does not consider the difference of those natures, of which he is composed, to be only in the onlooker's mind, a difference which is not compromised by the union (for he is one from both and the two exist through the one) but uses the plurality to suggest that each nature is possessed separately and has a subsistence of its own: let him be anathema. and yet, this Council contradicts itself in next anathema which was drafter confusingly just to spite the Orientals and in the process conflicts with the above quote which speaks of the difference as "only being in the onlooker's mind"
If anyone confesses a belief that a union has been made out of the two natures divinity and humanity, or speaks about the one nature of God the Word made flesh, but does not understand these things according to what the fathers have taught, namely that from the divine and human natures a union was made according to subsistence, and that one Christ was formed, and from these expressions tries to introduce one nature or substance made of the deity and human flesh of Christ: let him be anathema. We disagree with this because the illustrious Christological Father, Saint Cyril, explicitly states in his formula of the "One Incarnate Nature of God the Word." The crux of the Oriental debate is that we confess "one (mia) nature" and "one person" but we still conceive of the natural Union and the inherent preservation of the faculties of both humanity and Divinity, however in the ontological sense (i.e., concrete reality of the hypostatic Union) there can only be said to be One, whether Person or Nature, because the Subsistence/Hypostasis/Person/Body is mutually interdependent upon the underlying Nature, be it the complexity of Jesus Christ or the simplicity of an inanimate object like a chair, nature and person must coincide as one, naturally and essentially. If there is a separate nature, the hypostatic manifestation is subsequently affected. This is why our OO fathers accuse Chalcedon of Nestorianism, because they explain that there can only actually be one inherent nature of any given Hypostatic form, and that two natures would subsequently have to necessarily exist in two separate Hypostases. We do not abolish or absorb or confuse any of the faculties of the humanity and divinity, however can by our theological language only confess Christ as One Nature, One Person, One Will and Operation, after the duality was abolished in the Union of the Incarnation. However, as even the Chalcedon II canon suggests, we in OO theological thinking, still on our mind's eye think of the two Natures in distinction, just not function. We believe these function in the synergy of the Union, but still in dialogue we have been less antagonistic in our rhetoric, and even accept the terms "two" in discussion. Getting OO to even concede to use the term "two" has been a miracle of ecumenism enough on its own, I would argue that the ball has been in the EO's court for some time now, and since the 1950s the OO have continued to lead the way in dialogue towards reunion. I pray for the full unity of the One, Holy, Catholic, Apostolic Church, to be one as our Lord Jesus Christ is One. LOL. It's refreshing to see that such radical prerequisites for reunion are FINALLY coming from the other side. I do not think our Hierarchs would not require the Byzantines to canonize the Saint Dioscorus (though I would LOVE to see a Byzantine icon of him ). Would he be attacking Flavian like the Nicholas/Arius icon? Didn't you JUST say that you don't believe that he didn't beat Patr. Flavian? Or are you referring to this disaster of a thread? 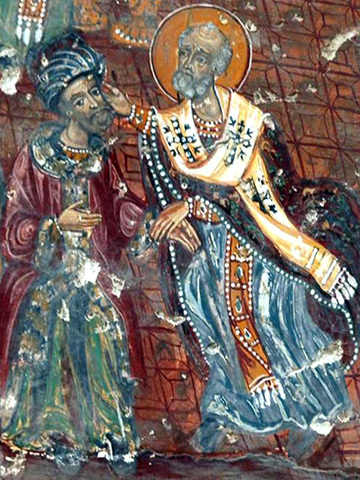 And St. Nicholas may have never slapped Arius. It's a later tale. Firstly (and I don't mean to be rude as I say this), the analogy you are using is a very bad way of describing the union of the Divine and human natures in Christ. Honey and coffee lose their distinction when they unite in the same glass. The Divine and human natures did NOT lose their distinctive characteristics when they united in the one hypostasis. Neither I, nor the EOs nor Saint Dioscorus ever believed this. Secondly, when Saint Dioscorus rejected "two natures after the union" he rejected the notions of two hypostases/centers of action in the Incarnate Christ. He always acknowledged the difference of Christ's natures when it came to composition. In fact, he was the first Bishop at Chalcedon to say that the two natures united "unchangeably, immutably, inseparably, and indivisibly". He also accepted the formula "from two natures after the union". Had he truly been a "mixer" of the two natures of Christ he would not have affirmed the Cyrilline formula "from two natures", it would be superfluous and pointless had he truly been a Synousiast. From the time of Saint Dioscorus up to now the OOs have always believed that one can distinguish between the two natures from which Christ subsists through subtle contemplation. Saint Dioscorus says "Our Lord Jesus Christ is one. He who was invited to the wedding of Cana as man changed the water into wine as God, and his TWO NATURES are not divided in all of his works". He thus affirms the reality, distinction, and completion of the Divinity and humanity in Christ after the hypostatic union. He also says "God the Logos, consubstantial with the Father, at the end of the ages for our redemption became consubstantial with man in the flesh, remaining what he was before". We should have a forum-wide ban on comparing Christ or the Trinity to drinks of any sort. But I'm sure Rakovsky only meant well. Thank you for bringing this up, Father. Severian, nothing to add or subtract from my Constantinople II Christological criticisms? You're like our OO Christology expert, I would love your input. But that's not a comparison, it's an identification! Thank you very much, you are too kind! Sure, I suppose I could give you an input, but probably tomorrow as I have a lot of studying to do. I'm asking again that people review my request made in reply 73. I am sorry if I have violated your request here, Salpy. Forgive me, that was not my intention. I suppose that if anyone wishes to speak with me regarding this feel free to PM me or join me at the private fora. I will be happy to discuss these issues with you in detail. My main question was whether the key difference is that: although EOs and OOs accept or allow for Miaphysitism (one nature after the union), and EOs believe in two natures after the union (Chalcedon's decision), do OOs dogmatically reject the continuance of two natures after the unity? after the union we ought rather to speak only of one incarnate nature of the Logos. when Saint Dioscorus rejected "two natures after the union" he rejected the notions of two hypostases/centers of action in the Incarnate Christ. So it sounds like you mean Dioscorus wasn't rejected two natures in the sense that the EOs used it- two "physia", I think? But this is confusing it seems like the EOs were saying two natures, and then Dioscorus said "No, not two natures", as if contradicting them. I assume the conversation would have been in Greek because they were physically present at the meeting, so the contradiction must have been decisive. Plus, EOs also reject two hypostases of Christ, which they interpret as "persons", and instead say He has only one person. I assume that Dioscorus and the EOs' face-to-face disagreement over "natures" wasn't over the number of hypostases, on which they agreed. Saint Dioscorus says "Our Lord Jesus Christ is one. He who was invited to the wedding of Cana as man changed the water into wine as God, and his TWO NATURES are not divided in all of his works". He thus affirms the reality, distinction, and completion of the Divinity and humanity in Christ after the hypostatic union. He also says "God the Logos, consubstantial with the Father, at the end of the ages for our redemption became consubstantial with man in the flesh, remaining what he was before". Yes, now I am more confused, because Dioscorus says "his TWO NATURES are not divided in all of his works", as if they still are two natures after the union occurred at Christ's birth. Maybe he means the natures, which became united into one nature at Christ's birth, are not divided in Christs's works? So here it seems like your focus is on what Dioscorus meant when he announced in disagreement: "after the union we ought rather to speak only of one incarnate nature of the Logos." Your explanation is that Dioscorus was talking about hypostases when he said "natures" (meanwhile EOs translate hypostasis as "person"). But if that was the case, it wouldn't have been such a big bone of contention, because the EOs agreed there was only one hypostasis, and they were talking in the same Greek language. ^Rakovsky, I will respond to you via PMs because Salpy wants to keep this thread on a focused track. She would prefer if we didn't discuss Chalcedon and related issues in detail. Yes, I understand. Can you please post it on a private thread, though? It's so confusing, and I understand the discussion best when several people try to explain it simply and in different ways. We are having a thread in the free-for-all section called "Latins accept Chalcedon for the same reasons OO's reject it?" It is a free-for-all thread so we can (AFAIK) get polemical and detailed if we want and at the same time we can enjoy the valuable contributions of Fr. Peter and others who do not have access to the private fora, let me check. If you can keep it within the parameters I set, that would be fine. But this is confusing it seems like the EOs were saying two natures, and then Dioscorus said "No, not two natures", as if contradicting them. You are on the right track, the bone of contention is how the differing fathers, Byzantine and Oriental, interpreted the Greek terms. When St Dioscoros reiterates the Cyrillian formula, he is speaking of One Incarnate Nature (i.e., Miaphysis) after the Union. This is our OO dogma and doctrine, that after the Incarnation there is only One nature (mia), composite of Human and Divine, without confusion or separation. It is a unique Nature of Christ alone, being both Human and Divine at the same time and therefore naturally and essentially maintaining faculties of both. Both the EO and the OO agree with this, but the EO insist in their languages "In Two Natures" rather than the Cyrillian and OO "From Two Natures" and the "In" leaves open the suggestion for the potential of a plurality where as the "from" implies the fullness of the Union. The explanation as to how the OO interprets the Unity of the One Nature, both human and divine, actually agrees with Constantinople II as I quoted above and again here. In the OO, we only conceive of "two" in our minds, we rarely concede to use such in our language, rather we speak of One composite Nature, both human and divine, and the distinctions only exist "in the onlooker's mind" as "the two exist through the one." We in the OO honestly do not understand sometimes why the EO insists on the language of two, even when seemingly we agree face to face, but in writing we find these discrepancies. As I quoted above, even the Constantinople II Council decided to specifically target the OO, Cyrillian and Dioscorosan language of "One Nature after the Union" and we in the OO have always been baffled by this, and unfortunately many of our fathers couldn't help but take it personally, which I think fuels the divisions more so than the theology. The EO use "physis" on its own, to describe a nature by itself, almost in the abstract, where as the Orientals have generally interpreted this term as being integrally related to hypostasis, and so we only speak of One (mia) Nature to be extremely careful never to suggest in our language and interpretations the potential for plurality. Both of us, EO and OO, realistically seem to agree in most regards, however the devil has always been in the details. the "In" leaves open the suggestion for the potential of a plurality where as the "from" implies the fullness of the Union. But on the other hand, does not "from" leave open the suggestion that the human nature existed apart/before the Incarnation and that there is a mixing of the natures? A union has to be 'of' at least two constituents. But after the union there must also be a unity. The non-Chalcedonians have never had a problem with considering the humanity and Divinity to be mixed. But quite clearly there are continuing issues with the constant presence of semi-Nestorianism throughout Church history. As an evangelical I was taught Christological error because a Cyrilline Christology was not adopted. I have corresponded with EO, even clergy, who have insisted that the humanity of Christ is a personal subject. If we start with the distinction between the two natures, it is to be doubted whether we shall ever succeed in truly uniting them. The non-Chalcedonians have never had a problem with considering the humanity and Divinity to be mixed. Didn't Severus of Antioch have a problem with this? And what do you mean by "humanity and divinity"? Surely you do not mean in a Eutychian (regardless of what the man himself believed) or Julian sense. Did Christ hunger to demonstrate his humanity, or because he was truly circumscribed? Did Christ die because he chose to open his incorruptible body to wounds, or because he was truly circumscribed? Did Christ weep because he wanted to demonstrate his human emotional faculties were genuine, or because he was truly compelled to weep in human grief like you or I? If God was not truly circumscribed, how can there be any true incarnation? St Severus absolutely never considered the humanity and divinity to be mixed. Nor actually did Eutyches, but there were a few who did mix the humanity and divinity and they were excommunicated. I am not sure what you mean by what do I mean by 'humanity and divinity'? I do not mean that the non-Chalcedonians mix the humanity and divinity of the incarnate Word, but that there has never been a movement to do so. Even the Julianists did not mix the divine and human, they believed that the humanity was glorified from the moment of the incarnation. Have I been sloppy in my language? I mean that 'eutychianism' has never been embraced by the non-Chalcedonians, not that we embraced it without concern. In regard to your second post, we know that the Fathers teach that the Word allowed His own humanity to express those characteristics natural to it as He chose, and that He is not bound by His humanity as we are. When He hungered He truly hungered. But He was not a mere man who was unable to do anything other than hunger. He is the Word of God incarnate. His humanity is not bound as ours is, even though it is true humanity. I do not mean that the non-Chalcedonians mix the humanity and divinity of the incarnate Word, but that there has never been a movement to do so. Oh. I thought you meant they never had a problem with it, in the sense that it was perfectly acceptable. the Word allowed His own humanity to express those characteristics natural to it as He chose, and that He is not bound by His humanity as we are. What Fathers besides St. Athanasius? What does it mean to not be "bound by a humanity"? Are you saying that as the Incarnate Word, Christ had to press some sort of cosmological "manual override" to engage his humanity to weep against His Divinity's... nature? Were there times before his Death that he chose not to express his humanity? What "other thing" would interfere with the Incarnate God's hunger? God the Word is only circumscribed in His humanity to the extent He chooses. The Word has become incarnate for a purpose, not to see what it is like to be a human. Therefore it is necessary that he be truly human, but not that he be circumscribed by his humanity. He is more than human, though he is truly human. What 'thing' would cause him not to experience hunger? I wouldn't put it like that. I would say that the will and purpose of God always directs the activity of the Word incarnate. He walks on water when he chooses. He sees Nathanael under a tree when he chooses. He knows what people are thinking when he chooses. All of these are not merely human activities, but they are also truly human. But he also hungers as he chooses, thirsts as he chooses, sleeps as he chooses. *HE* is the Word of God who is both human and divine. *He* is not a man called Jesus. Nestorius and Theodore understood the man Jesus to be in some sort of union with the Word. But we don't. Jesus Christ is the Word of God. That makes a difference. It doesn't detract from the reality and integrity of the humanity of the Word, but it means that the humanity is not bare humanity, or humanity apart from God. I guess I would be okay with this teaching if it could be stated this way: That the voluntary Incarnation of Christ remained voluntary throughout His life until His Death, but at no point did Christ make that choice to surrender assuming our humanity in truth, despite his trials. In other words, even if these "natural passion expressions" were voluntary, he never DID NOT choose them. And one could compare Christ's pre-resurrection humanity to the pre-resurrection humanity of the greatest saints. "but [He] emptied Himself, taking the form of a bond-servant, and being made in the likeness of men. Being found in appearance [literally: in the schema of] a man"
What is not assumed is not healed. The Word has become incarnate for a purpose, not to see what it is like to be a human. He says that he preserved his humanity from being naturally wasted by His Godlike power, and then at the end of his fasting allowed it to feel its natural sensation of hunger. I think that what St Cyril, and St Severus teach is different from what you are saying? Do you have any comments? I go along with St Cyril and St Severus which is why I have said that he is circumscribed only to the extent he chooses. Have not the saints gone ages without food by the power of God, but not by virtue of a hypostatic or physis union with God? I do not mean to disagree with St. Cyril out of some contempt or pride. I love St. Cyril's defense of Christ. But I do not think this is the only interpretation of Christ's fasting. Just as I disagree with St. John Chrysostom about the nature of the Council of Jerusalem, I must slightly disagree with Cyril here. he is circumscribed only to the extent he chooses. I think that in some sense, losing certain choices (like whether or not you want your side to open up when it is stabbed) is part of becoming circumscribed in the first place. I guess I would be okay with this teaching if it could be stated this way: That the voluntary Incarnation of Christ remained voluntary throughout His life until His Death, but at no point did Christ make that choice to surrender assuming our humanity in truth, despite his trials. In other words, even if these "natural passion expressions" were voluntary, he never DID NOT choose them. Without food, yes. Without hunger, no. In that case, Christ would have drowned in the Sea of Galilee.